Protection from the elements. Generators need to stay out of the snow and rain in order to function at their best. Furthermore, they need to be placed somewhere that the residents can reach safely, ideally without having to go outside. Statutes and codes. Civic laws stipulate where a generator must be placed and the distance of possible hazards such as air conditioners or furnaces. Power source. Generally speaking, a generator needs to stay as close to the electric meter and fuel supplies as possible. That makes it easier to operate and less prone to something going wrong. Maintenance. 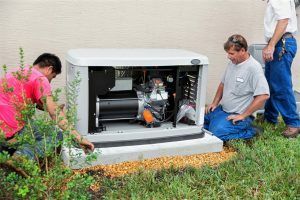 The generator needs to be placed where a technician can easily reach it to perform periodic maintenance. Regular maintenance ensures that the generator always works on short notice. Noise. Generators grow quieter with each successive generation, but they still generate quite a bit of noise. Ideally, they should be placed in a location where the sound of operation doesn’t disrupt the rest of the household. Contact Yost & Campbell Heating, Cooling & Generators to discuss the best options for generator installation in your home, and to find the ideal location for it! Residents of Yonkers, NY know all too well what kind of havoc Mother Nature can inflict. Our civic electrical system is very reliable, but that won’t always matter when the winds start to blow and the rain or snow comes pouring down. The best defense against such a development is the installation of an automatic standby generator in your home, which can kick in the moment the power goes out and keep your home safe and comfortable until regular power is restored. A trained service provider can help you select the right model and then install it for you. Here are a few basic factors to keep in mind when making your decision.